During my 50 years of practice, I have used many natural compounds that I investigated especially for treating cancer and other degenerative diseases. I recall organic germanium sesquioxide from the Japanese researcher K. Asai as one of the most interesting, effective, and fascinating experiences in my professional life. 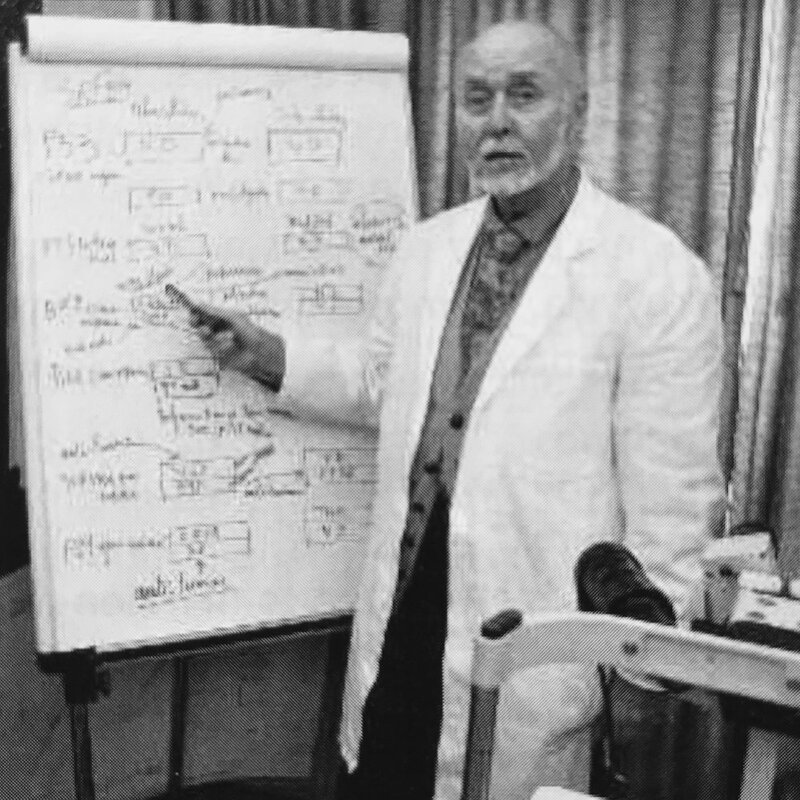 Dr. Alfred Vogel and I were both in close contact, and one day Dr. Vogel phoned me to say he was coming back from Japan and heard about a new substance to treat cancer called germanium developed by Dr. Asai. He suggested that I invite him to speak at my 1974 International Congress that I set up in the city of Aix en Provence, France. I then invited K. Asai, and he graciously accepted. At that time, germanium was almost unknown in Japan and totally unknown in the Western world; but my intuition told me that what we had here was a miraculous compound that will soon be adopted in most countries. I was not mistaken since the publication of Dr. Asai's book, Germanium-Miraculous Cure, started to attract considerable interest. In fact, the following year I was invited to Los Angeles for a cancer convention. I introduced germanium in my lecture; but at the time, it was still too early for the audience to understand its impact. I was an early adopter in the use of organic germanium or Geoxy 132 in my clinic. It was first synthesized and manu-factured by K. Asai and his team in 1967, at the Asai Germanium Institute. I discovered organic germanium had amazing curative powers. Basically, germanium is an organic, semi-metal semi-conductor with electrical properties found in the coal mines; but Asai also discovered its curative properties. By 1980, little by little many more positive reports came from the Asai Germanium Institute and other laboratories. The power of germanium is based on the fact that it increases oxygen in the body by expelling accumulated hydrogen as well as heavy metals. Geoxy 132 has been shown to increase gamma interferon (anti-viral activity) in the blood, activate macrophages and NK cells, T-cells, B-cells and demonstrate anti-tumor activity. However Geoxy 132, because of its electrical property, may disrupt the membrane of cancer cells and make them much less resistant and easier to destroy via chemotherapy or immune cell activation. Now, it is important to mention that after my initial meeting with K. Asai I began to use his Geoxy 132 from the Asai Germanium Institute over the next 16 years on several hundred cancer cases but also with other diseases, obtaining unique and memorable results. I kept close contact with him; and the following year, he came again to Europe to lecture and also to my home. Then over the years, I built up patient cases; and by 1987, I decided that I had enough experience to write a book on germanium based upon my clinical experience, including a large number of illustrated patient cases. During the ensuing the years, I used Geoxy 132 with adults, aged patients, and with many children. One was a 17-month-old baby girl with liver cirrhosis (after a blood transfusion) using 100 mg. of Geoxy 132 per day with a spectacular result. There was no toxicity even after taking organic germanium for 18 months. There were already misleading reports about toxicity, found only in inorganic germanium. In both children and adults, I used 400 mg and up to 600 mg per day, as in the case of an advanced cancer, obtaining complete recovery. My book on germanium and cancer shows an example of a case where, in 1988, an 11-year-old boy with a desperate brain tumor condition and a prognosis of six months or little more to live came into my clinic with his father. This boy recuperated totally after taking my treatment of 250 mg of Geoxy 132 per day, up until 1990. Today, the boy is a medical doctor using alternative methods as well. In my new book Health and Disease Begin in the Colon Featuring Prof. Serge Jurasunas Natural Medicine,you can readabout young patients treated in 1983 to 1988, in the chapter on clinical cases on pages 314-315 and from 318-319, with some very impressive outcomes. After 30 years have gone by, these patients were still healthy reaching adulthood. The patient was diagnosed with a tumor of the hypophysis and lost 90% of his vision from the left eye. On the way to surgery, he decided to first try something natural first. I started with 300 mg of germanium per day; and after two months, he recovered 100% of the vision. After three months, the tumor was gone. This really showed me how germanium is powerful even on a solid tumor. The patient had no surgery and no chemotherapy. I have a similar case with a large tumor that was eliminated without surgery. Today things can be different; I would recommend surgery for most primary tumors. As far back as 1971, toxicology tests made by the Asai Germanium Institute found that organic germanium sesquioxide was incredibly safe, even with a high dose. These results had been replicated by other laboratories in Japan and US, confirming no organic germanium toxicity. Even with long-term usage, there was no accumulation in the organs. It had been found that after a period of 20-30 hours that no traces of germanium could be found in the body, having been eliminated by the kidneys. In testing done on rats by the Japan Experimental Medical Institute after 90 minutes, you find only a very small quantity of germanium in kidney, such as 15.00 ppm, nothing in sufficient quantity that could damage the kidneys. However, there have been reported cases of acute renal failure with patients taking inorganic germanium and not the original organic Geoxy 132 from K. Asai. Inorganic germanium dioxide is toxic and accumulates in the body. It was associated with nephrotoxicity and acute renal failure after being given to aged sick and weak patients, who probably already had bad kidneys. The patients had been taking 600 mg of inorganic germanium daily for 18 months. The first report by Okada et al, in 1987, damaged the reputation of the germanium Geoxy 132 with two cases of renal compromise. Again, this was inorganic germanium dioxide and not organic Geoxy 132. Two years later, Okada revised his early position on organic germanium sesquioxide by demonstrating the safety of chronic high doses just as I had done with my patients over so many years. Unfortunately, the damage had already been done; the original misleading Okada error from 1987 had been continually cited for over 20 years with articles and TV programs warning people that germanium was not only toxic but dangerous, leading to kidney damage and fatality. By 1990, the reaction in France and England, after publication of my book, reached hysterical proportion, but one interesting question stood out: Why, from 1967 to 1987, had organic germanium demonstrated a consistent safety record and been in use with no sign of kidney compromise whatsoever? How come after nearly 20 years using Geoxy 132 in different dosages with a high dose up to 600 mg, and even in the long term, there were no complaints and no one died? The real problem was bad germanium, contaminated inorganic germanium coming from various Asian sources to exploit the need of a growing market. Of course, we can also refer to pharmaceutical drugs; how many thousands die every year from toxic effects? Did you ever see such discussion on TV? A few months ago, three infants died in France after receiving a vaccine against gastroenteritis and intestinal gases. Only a small article was released in the middle section of a national newspaper, mentioning the vaccine would not be removed but only needed to have a warning to medical doctors and parents about the risk. There would no longer be any further reimbursement from social security, but the vaccine would still be available. Anti-psychiatric prescriptions to aged patients are responsible for the death of 15,000 cases per year in the USA. Finally, I have accumulated considerable experience treating diseases such as cancer, scleroderma, Raynaud's disease, and rheumatoid arthritis with Geoxy 132 from 1973 to about 1992, after importation of germanium was prohibited in Europe. Portugal was the last country where it could be freely imported until Austria put strong pressure on the Portuguese health authority to prohibit germanium. This was no surprise, especially after the sad story about the prohibition of the anticancer agent Ukrain. See my article in Townsend Letter, February-March 2013 ("A Medico-Political Plot in Austria against the Natural Anticancer Agent Ukrain"). Of course, today there are several sources of germanium on the market, but one has to be careful about quality, purity and source. It is true that Geoxy 132 is a miraculous compound and not a drug, but a real gift from Nature or God. I really have lived through some great moments in my life with cancer patients and other cases of diseases that I presented in my book on germanium. I am not exaggerating about the power of this substance and will publish more stories about organic germanium and include cases with photos in my new blog (https://naturopathiconcology.blogspot.com). Antitumor activity of macrophages obtained from Ge132 treated mice. Proc Japan Cancer Association. The 38th annual meeting. Tokyo 1979. Asai K. Miraculous cure, organic germanium. Japanese publication. 1981. Aso H, et al. Antitumor effect in mice of an organic germanium compound (Ge132) when different administration methods are used. Gan To Kagaku Ryoho. 1985;12(12):2345-2351. Jurasunas S. Le Germanium Une response au cancer et au Sida. Ed. Aquarius Geneva 1989. Switzerland. Miyao K. Toxicology and phase one studies on novel organogermanium Ge132. Current Inf Dis. 1980;2:1527-9. Mizushima Y et al. Restoration of impaired immunoresponse by germanium in mice. Int Arch Allergy Appl Immuno. 1989;63:338-339. Okada S, Kiyana S, Oh Y et al. Persistent renal dysfunction induced by chronic intake of germanium containing compounds. Current Therapeutic Research. 1987;41:265-275. Sato I. Antitumor activity of new novel organogermanium compound. Ge132. Japanese Journal of Cancer Chemotherapy. 1979;6:79-83. Sato I, et al. Inhibition of tumor growth and metastases in association with modification of the immune response by novel organic germanium compounds. J Biol Response Modifiers. 1985;4(2): 159-168. Yashidi M, Arimori I. Effects of Ge132 in vitro on the activity of human natural killer cells. Med Biol. 1982;104:87-89. Serge Jurasunas is an internationally well-known doctor of naturopathic medicine and professor of naturopathic oncology with 50 years of clinical experience in the treatment of cancer. He is a pioneer in developing innovative therapies in cancer treatment and an expert in live blood analysis, oxidative dried blood testing, and iridology. He is the author of seven books, including the new Health and Disease Begin in the Colon. Serge Jurasunas has now become an expert in molecular markers testing related to cancer disease and follow-up treatment. He is an internationally recognized lecturer and frequent contributor to the Townsend Letter.